Many of you have read the STORY first told on my blog about the lawsuit in and around of the Star Trek Enterprise D poster. 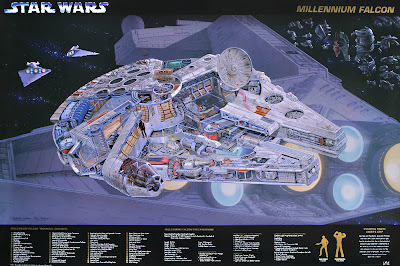 After providing JDT and Associates with all of my hard work and trusting them to market and pay me for the Enterprise D cutaway poster… one of the largest and most printed cutaways ever they abdicated their responsibility to me by stopping to pay me and forcing a two day trial which they lost to the tune of $62,000. While I won the battle I too lost the war as they filed for bankruptcy the next day. Many years of grief and lessons learned under that bridge and while it hurt me significantly I got past it and the love of the fan became my only payment for the work in the end and let me tell you that became more than enough… It also spurred both me and my brother Matt to find a new representative in ScPubTech and we successfully published a ton of other posters for both Star trek and Star Wars. 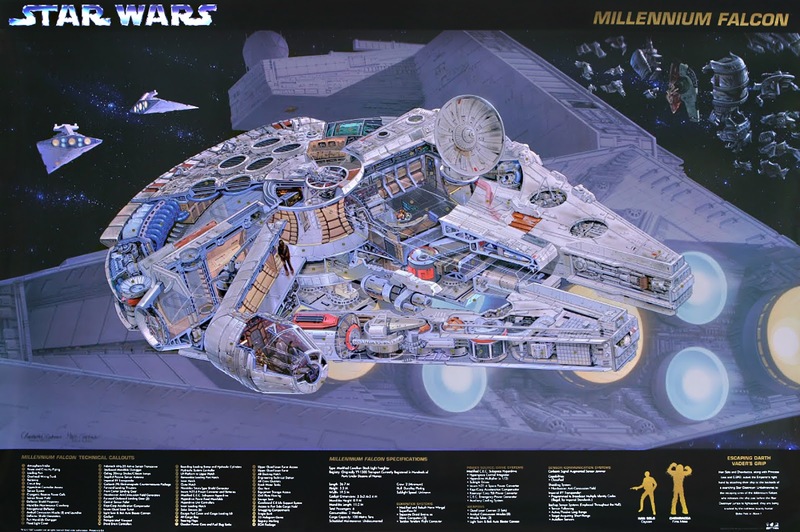 Tonight while searching my Star Wars Pinterest I found a website by artist Brian Sauriol detailing his work on the Millennium Falcon Poster which never made it to press. 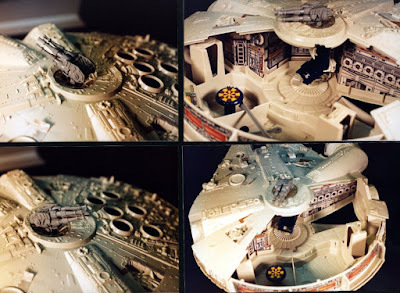 I had seen the work and sussed out the connection that JDT had dumped my Falcon concept in lieu for working with him. The cost of the project paid for by Enterprise D moneys but now under the corporate name Nonpariel Communications…. same Address at 2242 Star Court in Rochester Hills, same owner Julie D. Targos. 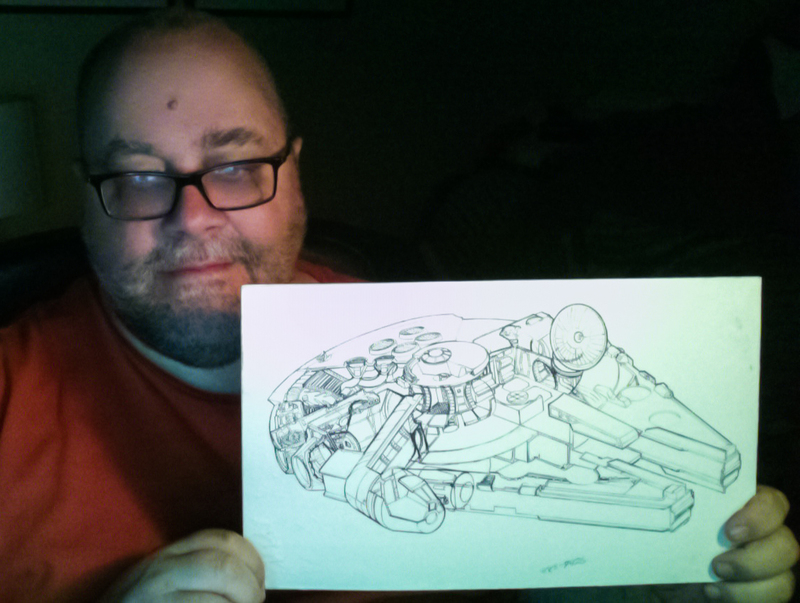 This was that concept illustration and the final line drawing and finished poster. By 94 we were in court and one evening before the trial I got a phone call from Brian Sauriol who was not unknown to me as he was a teacher at Macomb Community College and one of the people who supplied the area illustration shops with new graduates… Yet I really didn’t know him so it was a strange call… He felt compelled to ask me to stop with my law suit with JDT and Targos…. I had not known the connection or why he of all people would contact me… The phone call ended badly and it creeped me out. 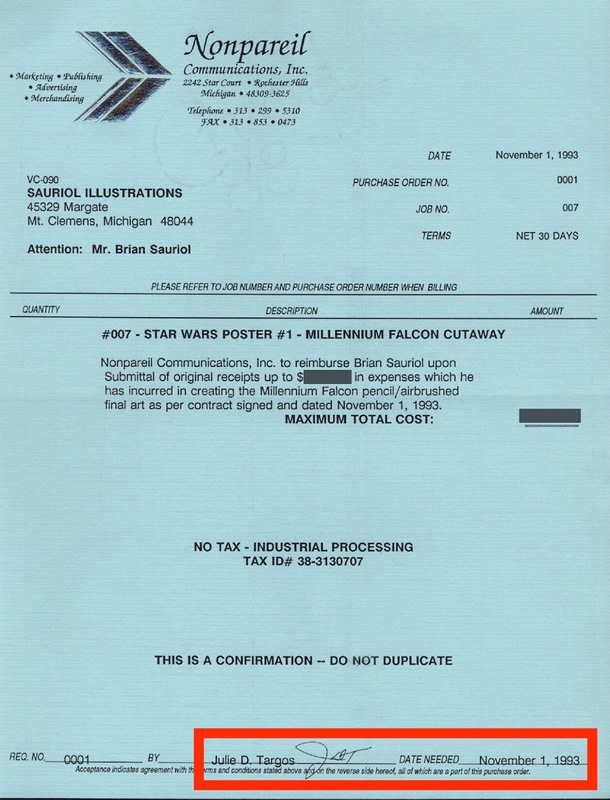 In 1995 I was at Miller Art Supply picking up some framed posters and thats when I saw the Sauriol Falcon also recently framed and the connection had been made. 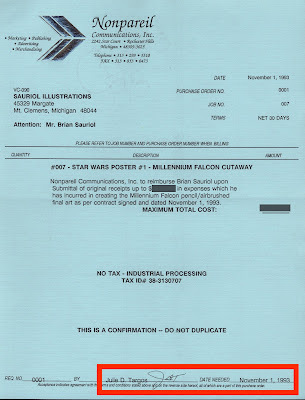 By 1995 we were already contracted to do the Falcon, X-Wing and ATAT posters for the debut of the revised Star Wars episodes 4-6… It became clear to me that the lawsuit and bankruptcy had foiled this duo's plans and in the end it was my Falcon that made the debut to the world! This seemed like perfect karma yet there was always some level of supposition of the Sauriol, Targos connection based on the scary phone call and details I did not have. Tonight it all became clear with THIS SITE found. 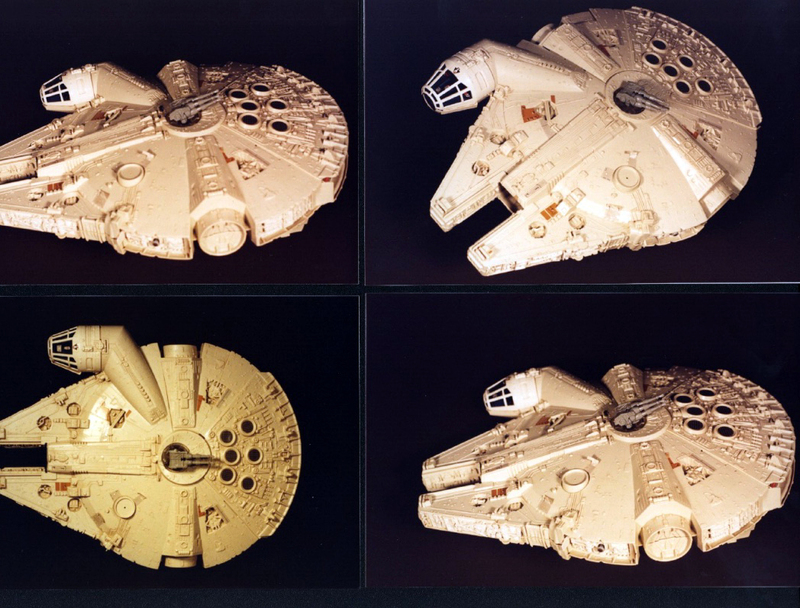 The site was published in 2013 and bills the Falcon as a project hidden for two decades! The details of the sources he used explain why the illustration is so inaccurate…. the photos shown of the hasbro kids toy… bloated and out of proportion and the list of details are limited…. 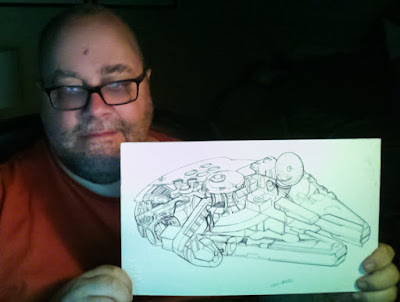 By the time I worked on finishing the Falcon Lucas Film had supplied me with full blue prints and photos but was also interested in a Falcon that squared three films worth of changing details into one final illustration… I consulted with designers and received notes from Lucas himself. Who would admit to using a hasbro kids toy as reference for a serious cut away? Tonight the details finally and completely come together… Now I know… What I feel is more completely vindicated but I also feel a sense of forgiveness for two truly pathetic people who took my ideas and art and tried to take the benefits of that work and make it their own. I have to forgive them because the alternative is to be consumed by the anger over the greatest loss in my professional life. But there is more to it than that... there was the lesson to never give up on my dreams to keep pushing for what was right and so I want to impress upon anyone who takes on a project such as this... They are labors of love and they are for the fans and they come before money and profit... and with all honesty they come from the heart!